Use on existing PANSS data or on yet to be collected PANSS data. Analyze completed studies to learn more from PANSS. Common platform to compare completed studies and new ongoing studies. Does not require any new training to medical personnel at sites. Positive and Negative Syndrome Scale (PANSS) total score is the standard primary efficacy measure in acute treatment studies of schizophrenia. However, the 30 PANSS items are, to varying degrees, inter-correlated. As a consequence of cross-item correlations, the apparent improvement in key clinical domains (eg, negative symptoms, disorganized thinking/behavior) may largely be attributable to improvement in a related clinical domain, such as positive symptoms, a problem often referred to as pseudospecificity. 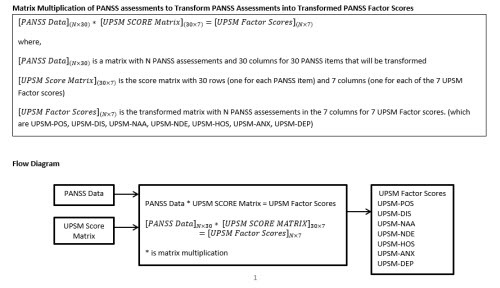 The Uncorrelated PANSS Score Matrix (UPSM or PANSS Matrix) score matrix minimizes the degree of correlation between each resulting transformed UPSM factor scores. The transformed UPSM factor scores correspond well with discrete symptom domains described by prior factor analyses, but between-factor change-scores correlations are markedly lower. The transformed UPSM factor scores provide a more robust understanding of the structure of symptom change in schizophrenia and suggest a means to evaluate the specificity of antipsychotic treatment effects. 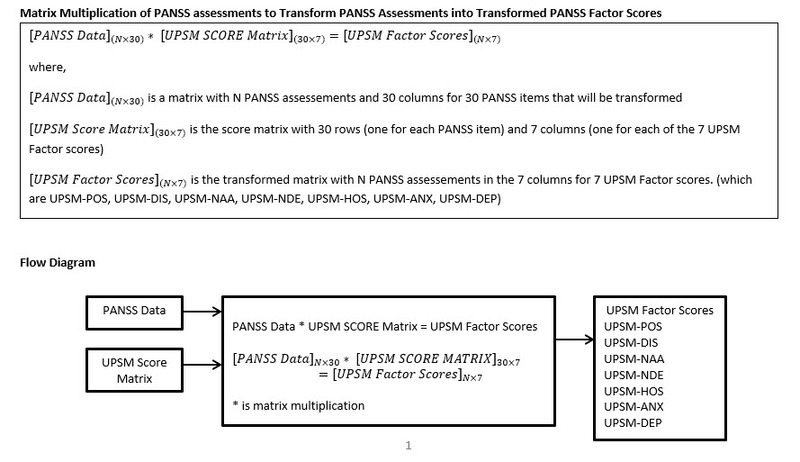 The coefficients of the uncorrelated PANSS score matrix (UPSM is a matrix of 30 rows of PANSS items x 7 columns of transformed PANSS Factors) are used to transform individual PANSS assessments (ratings expressed either as change from baseline, or as absolute ratings) to reduce 30 items into 7 factor scores for each PANSS assessment. Each column of the score matrix represents a transformed PANSS factor. Each column contains coefficients to multiply the corresponding item scores of PANSS.